Experience one of the most historically significant films like never before when Academy Award®-winning director Steven Spielberg’s Schindler’s List marks its 20th anniversary with a Limited Edition Blu-ray Combo Pack  featuring DVD, Digital Copy & UltraViolet  on March 5, 2013 from Universal Studios Home Entertainment. Schindler’s List 20th Anniversary Limited Edition has been meticulously restored from the original film negative in pristine high definition, supervised by Steven Spielberg and includes bonus features that shed unprecedented light on the story of Oskar Schindler, a member of the Nazi party who risked his own life to save more than 1,100 Jews during the Holocaust. One of the most meaningful films of our generation, Schindler’s List tells an extraordinary true story of courage and faith that continues to inspire. Spielberg personally supervised the extensive high-definition restoration of the film from the 35mm film original negative so that viewers can see this powerful story as never before. 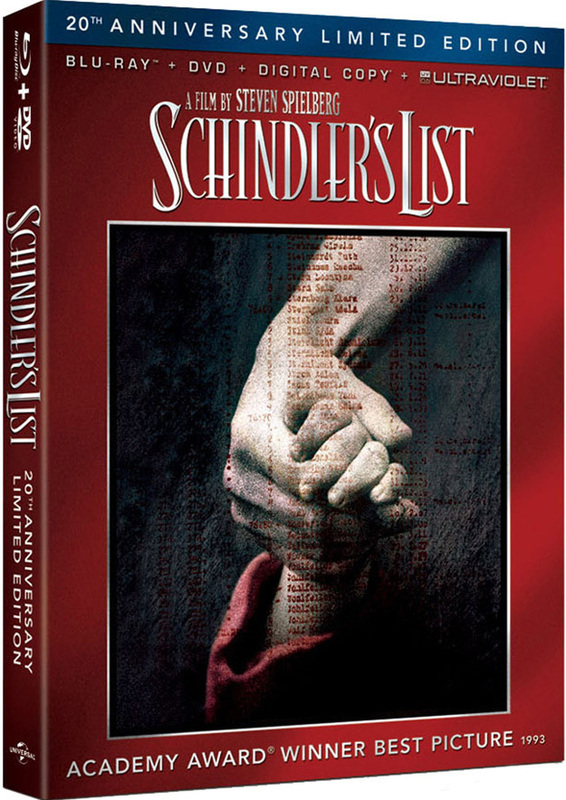 The Blu-ray Combo Pack allows viewers to watch Schindler’s List anytime, anywhere on the platform of their choice. It includes a Blu-ray disc, a DVD, a Digital Copy and UltraViolet for the ultimate, complete viewing experience. With its initial release in 1993, Schindler’s List rapidly became one of the most honored films of all time, garnering twelve Academy Award® nominations and taking home seven Oscars®, including Best Director and Best Picture for Spielberg. The film also earned Oscars® for composer John Williams (E.T., Star Wars), screenwriter Steven Zaillian (Gangs of New York, Mission: Impossible) and director of photography Janusz Kaminiski, as well as art directors Allan Starski and Ewa Braun, editor Michael Kahn and producers Gerald R. Molen and Branko Lustig. Liam Neeson (Taken, Gangs of New York) received a Best Actor Academy Award® nomination for his portrayal of Oskar Schindler. Ralph Fiennes’ (The English Patient, the Harry Potter series) star-making performance as the cruel Nazi commander, Amon Goeth, was nominated for Best Supporting Actor, as was Oscars®-winner Ben Kingsley (Gandhi, Hugo) in the role of Schindler’s Jewish accountant, Itzhak Stern. The historic release of Schindler’s List on Blu-ray also marks the beginning of the 20th year of the USC Shoah Foundation  The Institute for Visual History and Education. Inspired by the experience of making Schindler’s List, Steven Spielberg established the organization in 1994 to videotape interviews with survivors and other witnesses of the Holocaust. The USC Shoah Foundation’s Visual History Archive contains nearly 52,000 testimonies, each encompassing a complete personal history of life before, during and after a subject’s first-hand experience with genocide. Through its extensive educational initiatives, including the IWitness website for middle and high school students, hundreds of college courses based on the archive that are being taught at universities on four continents, numerous teacher training programs offered in over 20 countries, and major global research partnerships, the USC Shoah Foundation is dedicated to making its Visual History Archive a compelling voice for education and action. Spielberg considers this the most important work of his professional life and the legacy of Schindler’s List. Learn more and view testimony at sfi.usc.edu. – Blu-ray disc unleashes the power of your HDTV and is the best way to watch movies at home, featuring perfect hi-def picture and hi-def sound. – DVD offers the flexibility and convenience of playing movies in more places, both at home and away. – Digital Copy provides consumers with a choice of formats from a variety of partners, including options to watch on iPhone®, Android, computers and more. – UltraViolet is a revolutionary new way for consumers to collect their movies and TV shows in the cloud. UltraViolet lets consumers instantly stream and download to tablets, smartphones, computers and TVs. Now available in both the United States and Canada. – Voices from the List: Featuring documentary with testimonies from those who survived the Holocaust thanks to Oskar Schindler. – USC Shoah Foundation Story with Steven Spielberg: The director shows how filming Schindler’s list inspired him to establish the USC Shoah Foundation. Adapted from the novel by Thomas Keneally, Steven Spielberg’s masterful film tells the incredible true story of the courageous Oskar Schindler (Liam Neeson). Initially a member of the Nazi party, the Catholic Schindler risks his career and life, and ultimately goes bankrupt, to employ 1,100 Jews in his crockery factory during the Holocaust. Schindler’s Jewish accountant (Ben Kingsley) serves as his conscience, as Schindler conducts business with an obstinate and cruel Nazi commander (Ralph Fiennes), who viciously kills Jewish prisoners from the balcony of his villa overlooking a prison camp. Filmed entirely in black-and-white on location in Poland, Schindler’s List does not downplay the faults of its magnanimous and unlikely hero, but relates a story of the triumph of the human spirit in the face of horrific devastation and tragedy.